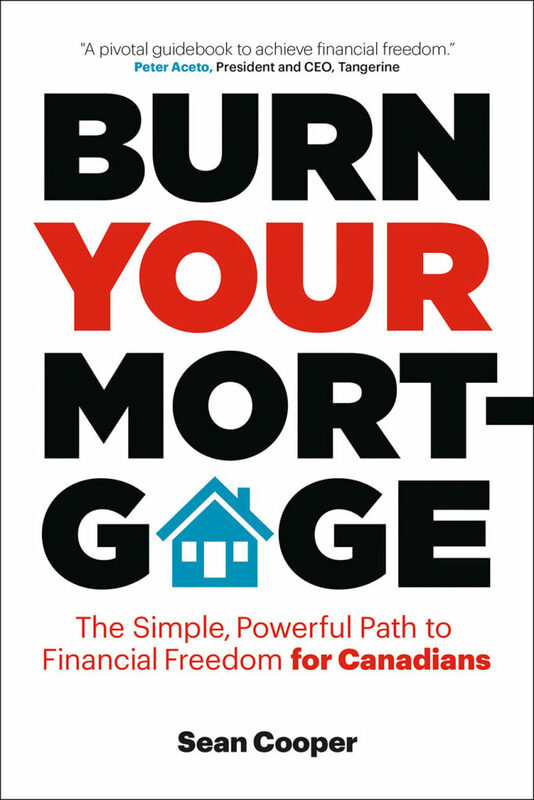 Interview with Sean Cooper, Author of Burn Your Mortgage. Sean Cooper made news headlines around the world when he paid off his mortgage at 30 on a house he bought three years prior. Sean’s story was covered by CBC, which generated more than 2000 comments on CBC news site. Sean’s story is super crazy for some and super amazing for others. Let’s find out more. This interview took place at Toronto Reference Library on December 1, 2017 (Friday @1800). The duration of the interview was 32 minutes and 18 seconds. Urgen Kuyee: Hi Sean, please tell me a little bit about yourself. Which school did you go to? How did you get into personal finance? Sean Cooper: Sure. I went to Centennial College first for 3 years and took business administration there. Then, I went to Ryerson University for a couple more years and graduated from their business management program with a bachelor of Commerce degree. I was always interested in writing, I had my own Pokémon website back in the day and is still on the world wide web now but anyway I started reading books like The Wealthy Barber by David Chilton and it got me interested in personal finance. I thought why not combine the two interests so I decided to write about personal finance towards the end of like 2011. Then, started writing for the blog million-dollar journey and then, after I had a byline out there. I applied for other websites like rate supermarket and then I ended up writing for tangerine and other websites. That’s kind of how it all started. UK: Why did you decide to buy a house in your 20’s? You bought it at 27, correct? SC: Yes. To be honest, I would have bought my house at 24 but the Toronto real estate market was super competitive so decided to wait till 27. I was looking for a house for 3 years but the main reason that I bought a house in my twenties is I believe that home ownership is a good long-term investment and growing up my parents were always home owners. So, they instilled in me the importance of owning a house and basically for savings that it offers. I thought it was a good long-term investment and that’s why I set myself a goal of owning a house. Ever since I was 10 years old I wanted it to own a house, some people want to be astronauts when they are younger but I wanted to be a homeowner as corny as that is. Ever since I got my first job, I was putting money aside for like the down payment of the house and graduated from university debt free. I worked three years full time and was able to come up with $170,000 down payment which is pretty good for a first-time home buyer. UK: That’s amazing. So, you said your down payment was $170,000. How much did your home cost? UK: You said that your mother was the inspiration for paying down your mortgage so quickly. Please tell us more. SC: Sure. When I was living at home with my mother, she’s a single mother raising my sister and me. So, she was basically the breadwinner for the family and responsible for paying the mortgage. Then, she lost her job at a couple occasions like during the dot com bubble as well as the financial crisis so I mean she was out of work for like 6 months both times and almost lost the family home. So, I saw being a single person trying to pay the mortgage on your own is definitely tough especially in today’s economy where you know you don’t know if you’re going to have a job in a year’s time or even tomorrow because precarious employment is the new norm so I didn’t want to find myself in the same situation. You have a mortgage for 25 years, you are bound to lose your job a few times over that period so I wanted to pay my mortgage as quickly as possible and not have to stress about that. People argued I could have made more money by investing and my counter point to that is you can always stop investing if you lose your job but you cant stop paying your mortgage because otherwise the banks are going to foreclosure under your property and you are going to lose everything. So, that’s why I focused on paying off my mortgage. I know the interest rates are low but I saw it as a low risk way to get rid of all that debt because I did have like over quarter million dollars debt to my name and I could not sleep well at night knowing that I had that much debt for just one person. 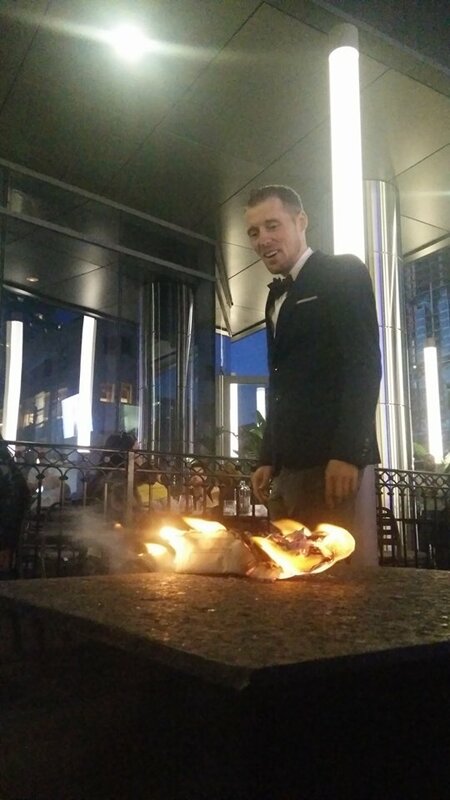 Here is a pic of Sean burning his mortgage. UK: So, it is kind of forced savings. SC: Exactly. You have to pay your mortgage if you want to have your house. Some people argue that you can rent and invest the difference and come out almost as well as a homeowner but the thing is people that rent, a lot of them you know there’s not that forced savings components so you know instead of saving that extra cash flow they spend it on travel and restaurants and other stuff so that’s why I’m a big fan of the forced savings that a home offers. UK: What are some things to consider before buying a house? SC: Well, I go through this in my keynote speech but first of all you should, some people have kind of a negative connotation with renting and people think oh I’m second class If I’m renting or second-best but I don’t necessarily think that’s the case like sometimes it makes sense to rent instead of buying a home. SC: Before you buy a home you should ask yourself several questions such as what are your long terms plans? For example, if you don’t know if you’re going to stay in the same city like next year or beyond and it doesn’t make sense necessarily to buy a house because of the transactional cost of real estate like the closing cost, the land transfer tax, real estate lawyer fees, home inspection fees because you could end up losing money if you have to sell your house quickly within like a year or so. So, figure out what your long-term plans are, if you’re not willing to stay put for 5 years or longer than I don’t think it makes sense to buy a house. If you’re willing to get a job promotion in another province or even overseas then I don’t think you should be buying a house. It’s really for people that are ready to settle down and I guess put down roots in stay put in the same place on and also, make sure that you know you run the numbers and that you can actually afford to own a house. It could make your current lifestyle tough because you’re probably going to have to make sacrifices. A lot of people assume that renting and owning a house is the same cost but that’s not necessarily the case like when you’re renting you pay the rent and perhaps the share of utilities. But when you own a house, you pay the mortgage and utilities, property taxes, home insurance and then a big one would be repairs and maintenance. The cash flow required to cover a house can be a lot more than just making rent payments. Make sure that you run the numbers ahead of time and figure out what your budget would be. UK: Let’s talk about your book, “Burn Your Mortgage”. Congrats, it’s a great book. UK: What made you write this book? SC: When my story came out on CBC’s the national and it was I guess controversial. SC: It was polarizing. Some people said I did a great thing and the other end of the spectrum said this is an extreme example and most people can’t learn anything from it. It is not normal to pay off your mortgage in 3 years. So, basically wrote the book for two main reasons. One to promote financial literacy because it is unfortunate that it is just about geography, history and biology in high school. They don’t even teach us about financial literacy so I wanted to promote financial literacy. The second reason was to give millennials hope that the dream of home ownership is alive. I know from speaking with a lot of my millennial co-horts that a lot of them had given up of ever owing a house in expensive cities like Toronto and Vancouver so I wanted to show them that it is still possible if they are willing to be smart with their spending and set themselves goals and that’s what I kind of explain in the book. UK: For someone who has never worked with a real estate agent, where are some good places to start looking for an agent? SC: I have some examples in my book but there are several places you can look for. You can go thorough your neighborhood and see like anyone who’s hosting an open house and try to find an agent that way. The only risk of that is that they could try to be representing the seller and represent you at the same time, dual agency and I’m not a big fan of that because there’s a conflict of interest. So, be careful about that. Another option is to go on the MLS website and look for agents that are selling properties in your neighborhood because they are probably familiar with it. You could go to a local real estate brokerage in your neighborhood. You could speak with family and friends, co-workers to see if they worked with a realtor recently and if they have any recommendations. There are several ways to find it but once you find a decent agent, I would say interview at least two or three before making a final decision because many people just find one agent whether it is a family friend or what not and they just go with the first agent but I would say it’s better to interview two or three. Make sure that you’re a good fit for each other because I had an agent or two over the years where I worked with them and we didn’t really see eye-to-eye and it was just a big waste of time for both of us. So, definitely take some time to get to know each other better and figure out whether you’re a good fit to work together because you don’t want to waste each other’s time and after working together for 6 months and realize it’s not working out. UK: You talk about the importance of a credit score in your book. However, some believe that credit scores and reports were developed entirely for the benefit of banks. Do you agree? Personally, I believe unless you have millions of dollars in cash, maintaining a good credit score is important. SC: Yes, I totally agree. Maintaining a good credit score is very important because that’s one of the four factors that lenders look at when they’re considering whether to give you your mortgage. They will look at your income, your down payment, your debt ratios and your credit score. So, your credit score is definitely important I mean if you have a huge down payment and your credit score is not the best, that might you know, well, it might not matter as much but I definitely think you should do everything you can to maintain a good credit score. My opinion on credit score is it needs to be updated with the times. For example, if you pay your rent on time to your landlord I think that should count towards your credit score but a lot of cases it doesn’t. So, I definitely think credit scores need to be updated more but that’s what we currently use. It is important to exhibit good behaviors and maintain a good credit score so that when you apply for mortgage you don’t run into any problems. Also, you can get a mortgage with a lender that offers a decent rate rather than having to go with one that offers a higher interest rate like going to shadow banking or anything like that because if you are paying a higher interest rate on your mortgage, it can end up costing you like thousands if not tens of thousands dollars so I believe maintaining a good credit score definitely helps you save money in the long run. UK: So, if I am looking to impress on a first date, should I whip out a copy of my credit report? SC: Hahaha. Hmm, maybe save that for the second date. UK: In your book, you talk about how you ended up losing on two houses because you didn’t make a clean offer when you first started house hunting. Can you explain the differences between a conditional offer and a clean offer? UK: Yes, I read that in your book. SC: Because of the two conditions that included financing and home inspection, I ended up losing the house. I am not saying go on clean offers always but by getting pre-approved for mortgage and by getting home inspection ahead of time, they call it pre-inspection on the house you are serious about buying then, that way you can go in with a clean offer and you know your offer will be that much more competitive if you’re in a multiple-offer situation or a bidding war. UK: How can prospective home-buyers use registered plans like their RRSP or TFSA? SC: If you are a first time home-buyer I recommend that you take advantage of the RRSP home-buyers plan. Under that plan, you can withdraw the $25,000 tax free from your RRSP. If you’re buying with a partner, that’s combined $50,000 between both of you. That’s a great way to do it but just make sure that you follow the rules. I remember reading one of Ellen Roseman’s articles where somebody withdrew money from their RRSP and they didn’t fill in the correct tax forms. They just took the money out and then, they had to pay some huge withholding taxes, which defeats the whole purpose. So, definitely make sure that you follow the rules. Also, you’ll have to pay back the amount over 15 years starting in the second year. If you failed to do that, then you will lose the RRSP contribution room forever. If you are not a first time home-buyer, I would recommend using the tax-free savings account (TFSA). You don’t get a tax refund upfront but your money grows tax-free so I would definitely recommend that. 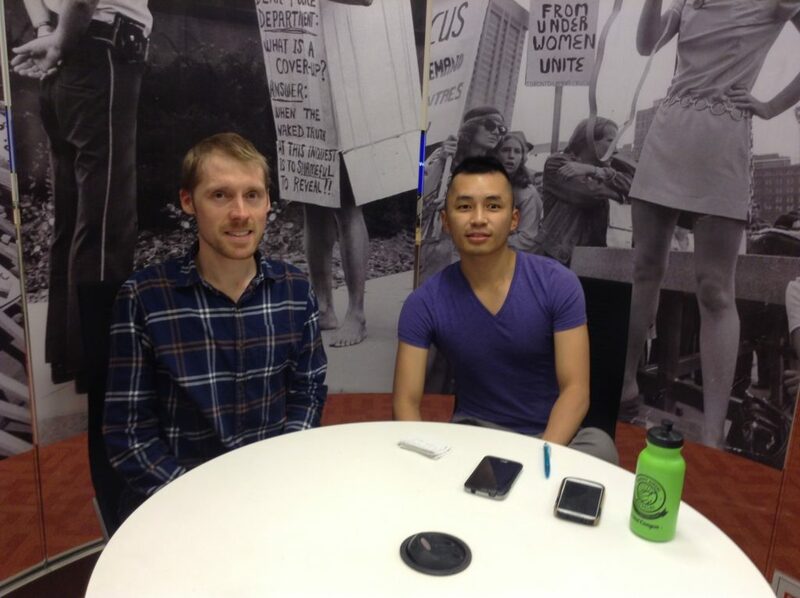 Interviewing Sean at the Toronto Reference Library. UK: In your book, you point out that the biggest surprise you got, as a first-time home-buyer was the closing costs. What are some of the common closing costs you will face as a buyer? SC: Sure. I guess sometimes first-time home-buyers are surprised at how much closing cost adds up to. I mean if you know it’s going to be $1000 or $500, there’s a lot more than that. There is home inspection fee, there are prepaid utilities, you might also have to pay 2 months worth of home insurance upfront and then, sometimes you have to pay utility setup fees. I remember when I opened a new account with the utility companies like hydro and water, I had to pay a set of fee with them. Of course, the big one that you have to pay is the land transfer tax and if you want any trauma, that’s two-land transfer taxes that you have to pay. So, definitely make sure that you are prepared for the closing costs and you budget for them ahead of time. There are calculators out there that can help you budget for them. I would say budget about like up to 4% of the purchase price of the house towards closing costs, just to be on the safe side. You don’t want to be caught with not enough money. Banks will not give you the money. That is your responsibility to put money aside from your down payment towards them. Don’t get caught begging your parents for money. Be responsible and put enough money aside. UK: Sean, you are a landlord. Everyone thinks being a landlord is all about passive income and easy-peasy work. This is not true. Can you talk about some of the challenges you have faced as a landlord? SC: Yes, I have faced everything from like major home repairs to tenants that have done damage to my house to tenants who haven’t paid the rent on time. I was just dealing with a flood in my house, with the dishwasher leaked through the floor. I have dealt with a ton of things. I mean being a landlord, I guess there is a big cliché but they always say if there’s like a leaky pipe at 3 a.m. you have to be ready to deal with it so it’s definitely like a job where you have to be willing to roll up your sleeves. You will be on call 24 hours a day 7 days a week. I mean I could get an email from my tenants saying some emergency happening at my house so you have to ready to deal with that. While it’s a great way to pay down your mortgage sooner and subsidized your mortgage in expensive markets like Toronto and Vancouver, just make sure that you’re ready to deal with the responsibilities that come with being a landlord because if you don’t enjoy dealing with people and you’re not ready to take on the extra responsibility, then it might not be the best fit for you. UK: Why did you choose to live in the basement and rent out the upstairs? SC: I was going to live upstairs and rent out the basement but then I realized oh you know there’s three bedrooms out there and I’m just one person why do I need all that extra space. I did the math and figured out I could rent the upstairs for double the amount so like I could rent the basement for 800 or I could live in basement to rent the upstairs for 1600. I’d rather pay down my mortgage sooner and I’m never home very much as it is so you know it just made sense for me to double my rental income and live in the basement. I mean some people think it’s kind of funny that I’m the homeowner and living in the basement but to be honest, I guess I get the last laugh because my house is paid off even faster so I don’t really have a problem with that. My house is paid off, I can move upstairs whenever I want or buy another house. It is a good situation to be in. UK: Like you said, many have questioned your lifestyle. There was so much hate online. How do you react or how do you deal with your critics? SC: I was hoping to inspire and motivate people to be successful with our finances. It’s really unfortunate that certain people feel that way. I would say everyone’s financial situation is different. Most people probably wont be able to pay off their mortgage in 3 years like me but if they can be inspired by my story to perhaps buy a house when they’ve given up or set themselves a goal of paying off their mortgage sooner than 25 years, whether it’s 10, 15 or 20 years. I think that’s great. While I’m a bit disappointed, I have received plenty of praise and people have been inspired by my story to follow my footsteps. I am happy with that and hopefully, if I can help just one person, then I would consider the book successful. UK: But, do you ignore the noise or just shut it down. Like, how do you deal with your critics? SC: Well, I just realized people will write stuff online and they wouldn’t necessarily say to my face. No one’s ever said anything mean to me in person. Online is what it is. You are anonymous so like you can say whatever you want. It is just kind of like water off a duck’s back. UK: Haha. We are almost done. Any plans to write another book? SC: I have been asked to ghost write books and be a co-author on one book but my book just came out March 1st of this year (2017) so yeah I just want to get more copies out there because I worked so hard on that book. Maybe in the future but I’m happy with just having one book out. I think my book is going to be relevant for the years to come because it’s definitely a timeless book. Maybe, there will be a second book in my future but writing one book was hard enough as it is. I am going to take a bit of a break from writing books for now. UK: How long did it take you to write this book? SC: It took about like 4 months to write the book but then after that, there was the editing phase that took another 3-4 months. Then, I had to market the book and make media appearances to help promote it. So, pretty much from when I had the idea for a book at the beginning of December and started writing, it didn’t come out till March 2017. That was one long year. It was definitely a long process but I was happy to finally be at the book launch party and see the book at Chapters and Indigo. That was definitely very rewarding and some of my co-workers and people that I know have seen my book out in public. One of my co-workers was at an airport and saw somebody reading my book and that’s nice to hear. UK: Nice. That’s pretty cool. UK: I know you blog as well. How many times do you write in a week? SC: For my own blog, I try to blog like once every one or two weeks but I write for other blogs as well. So, it depends. Some weeks I might write like 5 articles, some weeks, I might write 10 articles it depends on how busy I am with my full time job. But, I still freelance for a bunch of websites like tangerine and Rate supermarket is another website. UK: What is your writing practice like? Do you prefer writing in the morning, daytime or nighttime? SC: I generally write in the mornings and on weekends. Because when I get home from work I’m just too exhausted. Honestly, if I do it at 9 at night when I’m exhausted after day’s work you know I’m not going to get anything done and will fall asleep at the computer. UK: I can relate. I know you went for a trip to San Francisco recently. I was at San Francisco as well this summer for my cousin’s wedding. Tell me about your trip. Did you go to the Golden Gate Bridge? Did you go to the historic prison, Alcatraz? Did you go to Berkeley? University of Berkeley? SC: I didn’t go to Berkeley, I don’t even know where that is. So, I should probably go there now. I went to the Golden Gate Bridge. I walked along the Embarcadero like that nice boulevard there. UK: A little chilly there especially when you go visit the top of golden gate bridge. SC: To be honest, I was surprised about San Francisco. I was at San Diego the year before so I assumed San Francisco is going to be warm as San Diego but it was actually pretty cool and had fog everywhere. Unfortunately,I didn’t get to go to Alcatraz. UK: We didn’t either. The tickets were sold out haha. SC: Exactly. Same thing happened to me. They need to have a better system. It is ridiculous that the tickers are sold out for like 2 months. If I go to Toronto, I am not going to buy the CN tower tickets in advance. I am just going to buy it on the same day. I have heard this has happened to many people. My best advice is if you plan to go to San Francisco, order the tickets at least two months in advance or as early as possible because I guess the prison is in an island and they can let only so many people in island. So, definitely order them in advance. I have got to go back and see Alcatraz. I took a boat tour but it was not the same thing. I would actually like to go in the island. UK: What’s keeping you busy these days? SC: Besides blogging, I’m also speaking at the Toronto public library like you saw at my event. UK: Yes, that’s where I met you. SC: Yes. Also, doing money coaching as well. I’m helping people pay off debt, save for down payments and burn their mortgages. I am thinking about like doing some sort of online course. So, yeah that’s kind of you know what I have going in the next year or so and it is going to keep me plenty busy outside of my full-time job. UK: Lastly, where do you see yourself in the next 5 years? SC: Well, I set myself a goal that I want to get a million dollars net worth by age 35 but with the Toronto real estate prices, I probably already hit $1,000,000 net worth. So, I like to start my own business because I am an entrepreneur. I guess I am not sure if I can do this in 5 years but I have always dreamed of like being a dragon in Dragon’s Den. UK: Why not? You are still very young. David Chilton who wrote The Wealthy barber did the same thing. He published his books and slowly, entered entrepreneurship and became a dragon at Dragon’s Den. SC: Exactly. It’s definitely a long road to be there but eventually I would like to be a dragon one day. UK: Thank you Sean for your time. You can get a copy of Sean’s book, Burn Your Mortgage here. Next Post Interview with Doug Hoyes, Licensed Insolvency Trustee and Author of Straight Talk On Your Money.